Monday, July 15: 2 miles in 20:21 for a 10:10 pace (treadmill) + 5 miles in 54:29 for a 10:54 pace (outside). I spent a fair amount of the weekend before this Monday trying to figure out how best to fit in two three milers, one five miler, and one seven miler during the week. Ultimately, I decided it’d be best to plan on doing my long run on Monday, because if anything happened, I could push it off until later in the week (whereas if I planned on doing my long run on Thursday or Saturday and something happened that made it so I couldn’t run, for example, I’d be in a lot bigger trouble). Long running on Monday is hardly ideal, since it only gives me one day of recovery in between long runs, but since it’s a cutback week with shorter long run mileage, I felt capable of doing it this week. I’m 99.9% sure this will be a one-time thing (you’re not going to find me running 16 miles on Saturday and 18 on Monday). Anyway. The forecast for Monday (and all week) looked pretty hot and humid, so I opted to do my run in the morning. As I mentioned last week, morning workouts are really not ideal for me at all, because I am neither a speedster (see: almost 11:00 pace) nor do I have a short commute (it’s about an hour door to door for me). Seven miles at a heat index of 98 is also not ideal, though, so I drug myself out of bed at 4:30 to beat the heat. This, among other reasons, is I think one of the reasons why marathoners are often labeled crazy (though I prefer “dedicated” 😉 ). I ended up doing my first two miles on the treadmill because it was still too dark outside for me to feel comfortable running. While it might be perfectly safe to run solo at 5 a.m. in Chicago, I think there’s a big difference between being safe and feeling safe, and if you don’t feel safe, it doesn’t do you much good even if you are safe. Since I don’t feel safe running in the dark by myself, I gave the sun a chance to rise while counting down the seconds on the treadmill (I actually ran at 6.0 for a 10:00 pace, but it took me a little bit to figure out how to tell the treadmill to do what I want, and I wasn’t about to spend .01 miles more on that thing than I needed to) and then headed outside to finish off my run. “Dying” would be my word of choice for how I felt for four of those five miles. I really, really wanted to throw in the towel at the 2.5 mile mark, but since I was 2.5 miles from home (and was on a tight schedule, since I had to go to work), I figured I might as well keep running to get home slightly faster. I fueled at outdoor mile three (whenever I run seven or more, I start fueling at the fifth mile) and that definitely helped me out a lot, as did some shade and a teeny tiny cool breeze. And then I slept-walked through my entire workday because 4:30 a.m. and seven miles, you guys. We worked a lot on our first routine in hip hop and then learned a little bit of a new one. A solid workout. Break pretty much turned into bootcamp, as my teacher went on one of his, “You need to be strong to break, so let’s work on making all of you strong!” whims. Pushups on the floor, pushups on the barre, ab work on the floor, ab work on the barre…good times. Or something. We did get some breaking in too, though. Wednesday, July 17: 3 miles in 33:04 for a 11:01 pace. Thursday, July 18: 2 miles in 20:00 for a 10:00 pace (treadmill) + 3 miles in 34:20 for a 11:26 pace (outside). …I got up at 4:30 on Thursday morning to run before work again. This was a pretty quick turnaround for me. I had less than 12 hours between my runs, which is a lot less time than I like to take between runs, but since it was already over 80 by the time I finished my run around 6:15, I think the shorter rest was worth it. Except this run, you guys. Woof. The treadmill was whatever. I passed my time trying to get my Garmin to turn on. Does anyone else ever have that problem? Where your Garmin, even though it’s charged, just will not turn on? This happened to me a couple weeks ago, too, and it makes me so mad. If I’m going to drop $200 on a watch, I expect it to be able to work when I need it to. Hmph. Anyway, I tried to turn my Garmin on at 15 second intervals for 12 minutes on the treadmill before it finally came on (that’s about 48 tries, not including the times I tried before I left my apartment and the times I tried while I was headed to the treadmill, for those of you keep tracking at home. RIDICULOUS), but at least it kept me occupied. My run outside was rough, team. So rough. I was obviously already sweaty from my treadmill time, and when I stepped outside and felt absolutely zero cool relief, I was not thrilled. My legs did not want to move (clearly), and this run felt sloooooooow and looooooooong. I played my “Let’s count how many people I see” game to try to pass the time (103, which kind of puts that 78 in perspective. There really aren’t that many people out at 5:30 a.m. compared to what I’m used to, and I still saw way more people on Thursday morning than Wednesday afternoon). 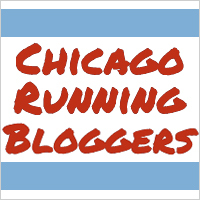 I also spotted Wendy Jaehn running, which was my first ever Chicago running celebrity sighting (which, granted, Wendy Jaehn probably isn’t considered a celebrity outside the CARA and/or Chicago running world, but whatever. I spend enough time in the CARA/Chicago running world that she’s a celebrity to me). After about 1.66 miles my right ankle randomly started hurting, to which I thought, “Well, that’s a new one!” I’ve never had any ankle pain on a run before, and it made me a little nervous that it wasn’t just a one- or two-time twinge that went away immediately, but by the time I was at 2.5 miles my ankle felt fine, so I’m not putting myself on the DL quite yet. Speaking of new things, for the first time ever I had sweat collecting on the bottom of my sunglasses and dripping onto my face. That’s never happened before! Ah, the fun, cool things that can happen on sauna runs! So yeah. Definitely not the best run of my life by any stretch of the imagination, but I was glad I got it in and over before it got too tropical outside. “Rest,” really. It was a good friend’s birthday on Saturday, and I don’t know if spending several hours on your feet in heels really counts are rest (although I also don’t know if it counts as training…haha). Saturday, July 20: cross training. Oops. Soo I was going to run three miles on Saturday. I really was. And then Friday night and yeah. So I didn’t run those three miles. I did, however, go to breakdance, and the teacher we had this week is notorious for his HIIT style of teaching. We went hard hard hard for an hour, and I was exhausted enough that I felt like made up for my lack of running. More birthday celebrating also ensued later on, but fortunately I had the sense to wear sandals instead of heels for round two. Sunday, July 21: cross training. Finally, finally, finally finished softball. We lost. As you can tell, I’m very torn up about it. After softball I went to get ice cream with a friend (it was National Ice Cream Day after all, and we had many recent life events to debrief), and we ended up walking around a lot. Map My Run says we walked 3.75 miles, which isn’t too shabby if I do say so myself, and may even make up for that three mile run I skipped on Saturday. It’s about to be another weird week, but I think I’ll be able to avoid too many 4:30 alarms and still get everything in that I need to. When I was walking with my friend on Sunday she commented on how much time marathon training takes, and I’m really starting to feel that way. I know putting in time now will (in theory) make things a lot more doable come October, but I have, in recent weeks, found myself kind of resenting the marathon for how much of my life it’s eating up. Obviously it’s something I’ve brought upon myself and I am glad that I’m taking on this challenge…I just wish it weren’t so difficult to train for a marathon and still be able to have a life outside of work and running. Hey! You’re sticking the the plan and making it work! We aren’t crazy, we just run at optimal times right? For the pre 5am running, a couple things can help, wear a little blinky LED light you can order online for a few bucks, maybe invest in a little alarm, like this http://goo.gl/7jWQFJ . My wife has one. And maybe find a running buddy to at least start with until it gets bright or busier on the path. The lakefront is actually really calm, it is getting that where you might hit sketchy. For your ankle, I do this exercise: lift yourself up onto both balls of your toes, shift to one foot and lift the other leg up and slowly go down on the other ankle. Do this 15 times on each side, 2-3 sets. Helps keep your ankles strong. Thanks for all these suggestions, Declan! I really appreciate it! Way to go with fitting your runs in this week! I think you’re doing a fabulous job with preventing marathon training for consuming your life. Yes, it is a big commitment and takes up time, but you seem to be keeping a good balance with other fitness and things like breakdance that you really enjoy which is awesome :). The weather last week was so so so gross. Somewhere I heard that it is supposed to be the hottest week of the summer though so if that’s correct, everything else should seem chilly from here on out! Thanks! I think sometimes it feels like I’m just always working, working out, eating, or sleeping, and I forget that that even though I may be counting things like dance as “marathon training,” it really is more just something I enjoy doing that gives me a nice cardio workout. Here’s hoping with the weater! I’d be perfectly all right with cool weather for the rest of the summer, or at the very least on October 13.
oh god see the 4 hour is not one I can ever wake up and run in. just way too early for me. good for you lady! Ha tell me about it. Least favorite thing ever. Gotta do what you gotta do, though, eh? Stupid hot weather. At least it’s gone now! Thank you dear! That 4:00 hour is pretty brutal, and I’m very much hoping I never have to see it to run again. Now I just need to find myself a Danielle to keep me company on my runs! Hahaha right? I keep thinking about all these things I want to do after marathon training is over, which probably isn’t helping me out in the “the marathon is eating my life” department. Must work on living in the moment! It’s nice to know not all plans have to be this time consuming, though, so in case I ever do decide to run another marathon, I won’t be able to use “But I like to have a life!” as an excuse for not doing it haha.